Water generation from unconventional resources (e.g. dew or fog) can be a reasonable addition or even alternative to groundwater use in areas with scarce precipitation. For several years, the Munich RE Foundation has been supporting the installation of a drinking water supply from fog for several villages near Mount Boutmezguida (Morocco). 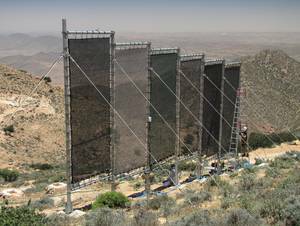 Following initial problems with conventional fog collectors, both an alternative collector construction and different fog net materials are being tested since autumn 2013. The project is run by the German Wasserstiftung and the local NGO Dar Si-Hmad, with scientific support from the Chair of Ecoclimatology at Technische Universität München (TUM). Students that are involved in this project are supported financially by the Munich RE Foundation. Fundamental questions from a scientific point of view are the durability and sustainability of the fog collector and the fog net materials used; their yield (also in dependence of meteorological parameters) as well as the quality of the fog water in comparison to the current water supply from wells.